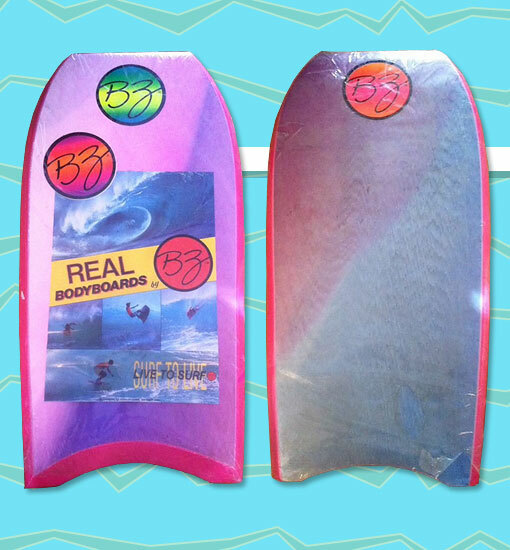 Already famous for their exclusive slick skin Diamond Rails, BZ pushed the limits of bodyboard innovation in the late 1980s with the Diamond Slick model. The BZ Diamond Slick featured a never-before seen feature: an all-slick skin exterior. The result was a fantastic looking board covered entirely with with BZ's signature "Tie Die" slick skin. Not surprisingly, the slick skin deck was extremely slippery and required a substantial coat of surf wax. The BZ Diamond Slick paved the way for another all-slick board, the Danny Kim model. This particular board is still in the original packaging.